[Amsterdam, ca. 1880]. 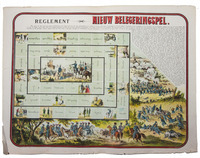 Large chromolithographed plate (46 x 60 cm), with a board game consisting of 56 squares, with at the head and on the upper right the rules of the game, and at the foot and lower right an illustration of a field battle. 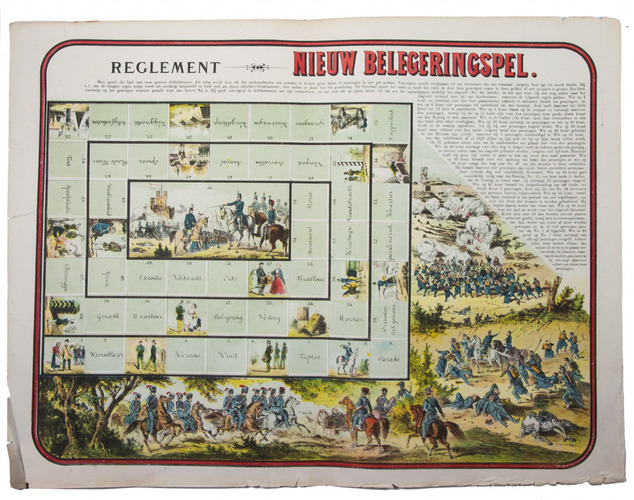 Rare chromolithographed board game named Nieuw belegeringspel ("new siege game"). The game is to be played with two dice and some chips (or real money), and the goal is to win the battle by reaching the 56th square. Along the way the players face obstacles and may receive or have to pay "money". Slightly frayed around the extremities, otherwise in very good condition.